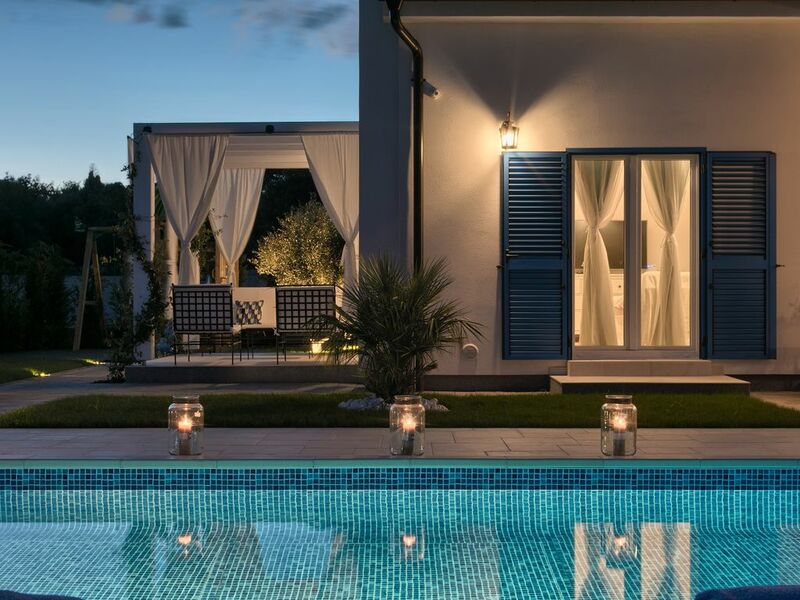 This modern and beautiful villa is located near Porec, in Tar-Vabriga. New elegant provides enough space for up to 10 guests (8+2). Except from pool, play ground, BBQ and 2 city bikes it has very nice outdoor lounging areas. Very close to little village Tar where you can find nice local restaurants, coffee shops and markets. Sea and wonerful beache are only 2.5 km away. On the ground floor there is fully equipped kitchen with dining area, living room and one bedroom with en suite bathroom. On the upper floor there are 3 bedrooms with 3 en suite bathrooms. Villa Lara has green garden with private pool and outside dining table with barbeque. Your youngest ones will adore garden playhouse. For more fun in the villa there is table football. Villa Lara is air conditioned, has WiFi, private parking for 2 cars and provides everything for an enjoyable holiday. .
ll bedrooms have A/C and TV. Bed linens are provided and changed once per week. Baby cot available upon request. We loved staying at this villa! It was a perfect combination of a countryside feel while having easy access to nearby cities. The pool is gorgeous and has the most incredible views that I could stare at all day. The place is very well kept and beautifully decorated. We had a wonderful time enjoying dinner and wine in the pool area and exploring the city of Porec, Novigrad and Rovinj during our stay. Thank you so much for an amazing Istrian experience! We stayed at the villa in the spring time, weather was beautiful and since the pool is heated we fealt like it was summer. Villa is very well equiped and has everything one need on a holiday. There are many very nice restaurants close by and we were amazed by the fact that everything was open. My family and me stayed at this great place, it was april the weather was perfect we enjoyed heated pool and great surrounding of the villa. Our host Tanja was absolutely lovely and helped us with local insight. Location is perfect close to the sea and beaches. I would definitely recommend this villa!